A spine fusion is a surgery performed to link together individual segments, or vertebrae, within the spine. The spinal column, or backbone, is made up of individual bones called vertebrae. These bones are stacked together. Between each of the vertebrae is a soft cushion called a disc. The disc spaces allow each vertebra to bend slightly. This motion allows us to bend forward and arch backward. A spine fusion is a surgery that is done to link together two or more vertebrae. When there is a problem with the vertebrae (often a problem with the disc space), your doctor may recommend a spine fusion to eliminate the motion that occurs within that portion of the spine. By linking together the vertebrae, your doctor is trying to eliminate the source of your back problem. During spine fusion surgery, your doctor will attempt to stimulate bone growth between the vertebrae. Once new bone forms, the vertebrae will be linked together, and there should be no further movement between the fused segments. As part of the process to perform spine fusion, your surgeon may recommend spinal instrumentation. This means that your surgeon will also place metal within your spine to hold the vertebral bones together. Spinal instrumentation exists in many different types. 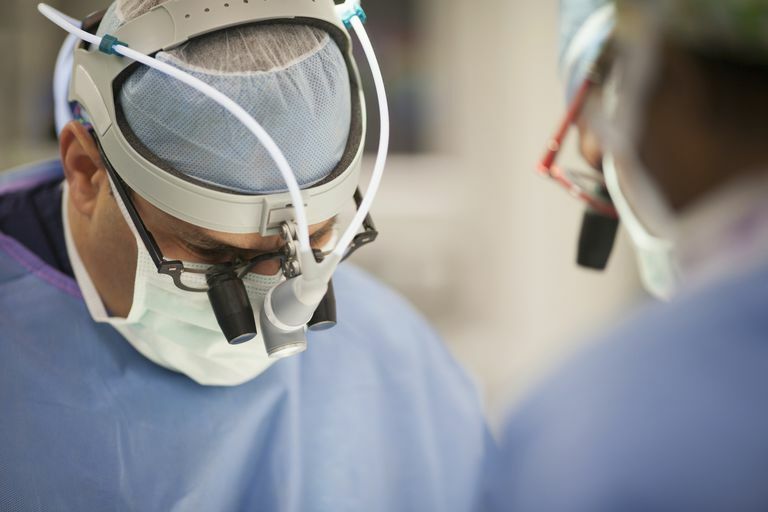 Your surgeon will recommend a particular type of instrumentation, depending on many factors including the underlying problem being treated, the age of the patient, the number of levels of the spine being fused, and other factors. If the segments do not fuse: One of the most difficult parts of spine fusion surgery, is that often it is hard to get the new bone to grow. There are ways to stimulate bone growth in spine fusion surgery, but like everything else there are potential drawbacks. The possibilities to stimulate bone growth include using extra bone from the pelvis (autograft) to stimulate new bone growth, using bone chips from a donor (allograft), or using a manufactured bone substitute. If the vertebrae and discs next to the spine fusion develop problems: This problem tends to develop years after the surgery. When the bad segments of spine are fused together, the segments next to the fusion have more forces applied. This so-called 'adjacent level' degeneration can cause problems after successful spine fusion. This is one reason why spinal disc replacement is being developed. Other risks of spine fusion include blood loss and infection. The potential for one of these complications depends on the extent of the surgery being performed. You should discuss these possible problems with your doctor. The other complication which concerns many people is the possibility of damage to the spinal cord or the nerves which exit the cord. Again, these risks will vary depending on the type of surgery being performed. While the majority of patients will improve following spine fusion surgery, there are potential risks. In some type of spine fusion surgery, your doctor can use special monitors to measure nerve function during the surgery. Smokers often feel as though they are being constantly harassed by doctors about the risks of smoking. Well, here is one situation where you should listen. If you are a smoker, and you are having spine fusion, you should stop smoking. The risk of spine fusion failure—the lack of the new bone forming—goes up about 500% in smokers. We know that smoking impedes new bone formation, and nowhere do we see this more than in spine fusion surgery. Is Lumbar Disc Replacement Surgery Right for Me?